Sherbrooke, QC. 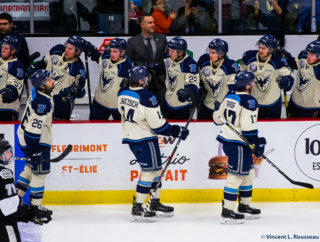 – The Drummondville Voltigeurs rolled into the Palais des Sports on Saturday afternoon and did what they do best; score goals. The league’s highest scoring offence found the back of the net early and often against the Phoenix to defeat the Birds for a fourth consecutive time this season. The Volts grabbed the lead just 0:52 into the game and never lost it, as they went on to win 6-1 on a cold afternoon in Sherbrooke. The Phoenix had their chances to score and get back in the game, but Olivier Rodrigue took care of business, turning aside 37 of the 38 shots that came his way. After the first period, the Birds found themselves down 3-0. The coach ordered his players to not give up and he was pleased with how they responded. “What we wanted was them to continue working, and to not give up. I think the guys did that. In the first period, there were a few times where we turned the puck over in our zone which costed us some time, and a lot of energy. I think the guys stuck together, we worked hard, and we had our scoring chances, that’s not what was missing, but their goalie made timely saves and we were unable to come back in the match,” said Julien. The game was less than a minute old before the Volts found themselves up 1-0. Joe Veleno busted up the wing and beat Dakota Lund-Cornish between the legs. Just 24 seconds later, Veleno thought he had scored his second of the contest, but the goal was waved off because of a high stick. 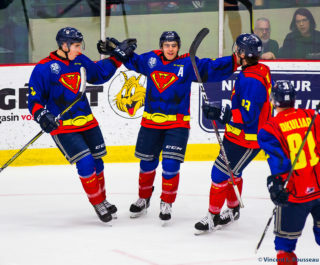 He did register a second goal later in the period to give his team a three-goal lead however, but not before his teammate, Gregory Kreutzer made it 2-0 on the power play. The second period began exactly how the first did, with an early Voltigeurs goal. Xavier Simoneau netted his 15th of the year to make it 4-0. Shortly after, Nicolas Guay added salt to the wound, tapping in Drummondville’s fifth goal of the game. That marked the end of Lund-Cornish’s afternoon as Thommy Monette came in to replace him. 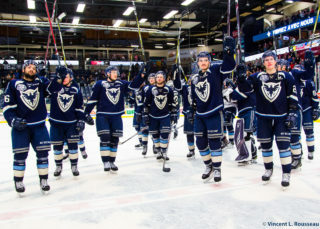 Nathael Roy sparked a roar at the Palais des Sports when he scored the Phoenix’s first and only goal of the afternoon, before the end of the middle stanza. In the third, the Phoenix had a flurry of opportunities to beat Rodrigue but were unable to get one past the Edmonton draft pick. 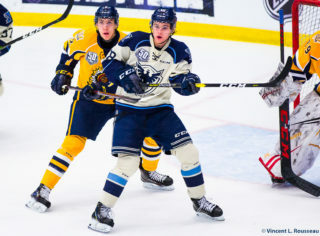 Nicolas Beaudin was however, able to beat Monette for the Volts sixth goal. Sherbrooke outshot the opponent 38-34. The Phoenix will face the snow storm on their way to meet up against the Blainville-Boisbriand Armada, tomorrow afternoon at 3:00 p.m.